As I was exiting the elevator after my morning walk, I saw my neighbor hard at work sweeping the walkway in front of her condo. Our maintenance crew maintains the outside area of our units, but for some reason Ann was pushing her broom back and forth with vigor. Ann is new to our building so I wondered if perhaps she had not realized that the outside, common areas are taken care of for us. I greeted her and asked, “Did you know that Lou sweeps the walkway for us?” She replied, “Yes I know. I just wanted to tidy up my space a little bit more.” We went off that subject to talk about the weather, how many times she notes my comings and goings, and what was going on downtown this weekend. And with that, I moved on to my own front door. I couldn’t help but notice a few little leaves on the brick, having fallen from a nearby potted plant. I bent down to pick them up. After all, there were no leaves or bits of anything in front of Ann’s front door, so the least I could do was tidy up my own area. I of course found some ordinary walkway dirt and some grit from the bottom of my tennis sneakers as well and ended up getting a broom and sweeping, just like Ann. Now our little area sparkled. My point of course goes well beyond keeping our world clean of dirt and litter. My message is that we all need to do our part to care for one another. We all need to feed hungry children, find housing for the homeless, locate and help rehabilitate abused children and women. We all, collectively, need to add kindness to the world, speak up against wrongdoing and injustice, add smiles and bring laughter wherever and whenever we can. The emphasis is on we, because no one is excused from helping to make the world a better place. No one has a “Don’t have to do anything” card. We all have to step up. The world is a big place and there is a lot to do, starting in our own neighborhoods. 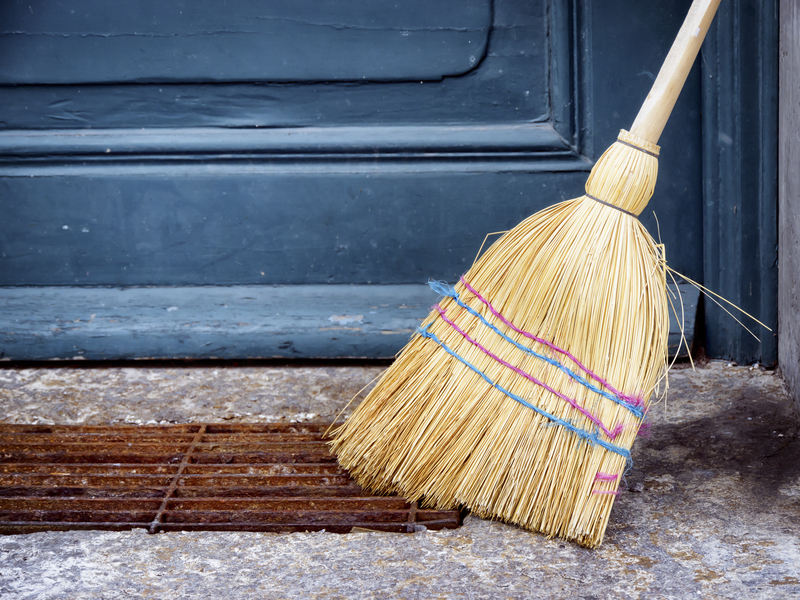 If everyone sweeps before his own front door, then the street is clean. We need “collective sweeping” so that we create a groundswell of many cleaning up in their neighborhoods, and before you know it, our collective sweeping has made a huge difference. This entry was posted in Uncategorized and tagged cleaning up, inpsirational, inspirational message, responsibility, Successtrogen, sweeping, von Goethe, women in leadership. Bookmark the permalink. Well said! Now we have to DO ! And by doing, others will follow, cleaning up one “doorstep” at a time.